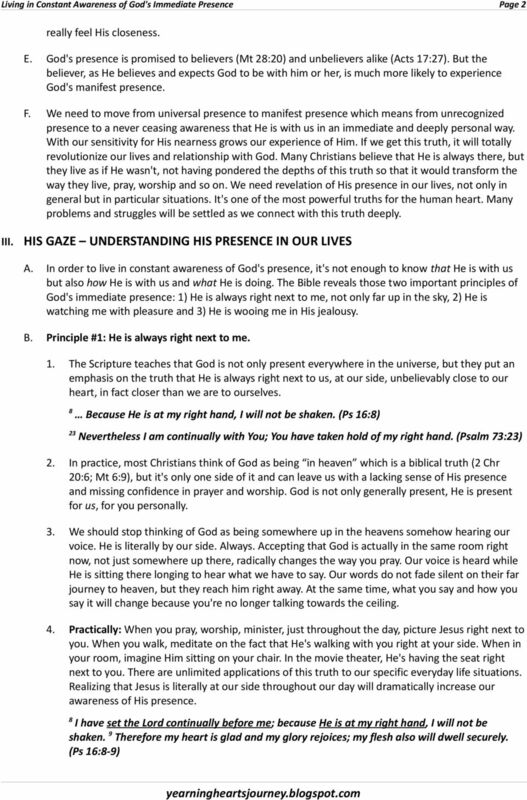 Download "Living in Constant Awareness of God's Immediate Presence"
3 Living in Constant Awareness of God's Immediate Presence Page 3 C. Principle #2: He is gazing at me with pleasure. 1. Living in God's presence is inextricably linked with living before His eyes, living in the audience of One. He is not only right next to us somehow distracted being busy with other stuff, but His eyes are fixed on us. We have His full attention. 2. Even though God is watching believers and unbelievers alike (Prov 15:3; Ps 33:14), there is an important difference in the fact that God actually enjoys watching those who love Him and delights in them. It is crucial to realize that His main interest in looking at us is not to be able to see every mistake we make, but to take pleasure in His creation that moves Him. 1 Behold, the eye of the Lord is on those who fear Him, on those who hope for His lovingkindness. (Ps 33:1) 4 For the Lord takes pleasure in His people (Ps 149:4) 11 Then the King will desire your beauty. Because He is your Lord, bow down to Him. (Ps 45:11) 3. Even when we are sleeping, He stays close to us, watching and taking delight in us as we sleep. 3 He who keeps you will not slumber. (Ps 121:3) D. Principle #3: He is wooing me with jealousy. 1. God's activity exceeds mere watching of us. God is not content with only seeing us, even though He takes pleasure in the people who love Him, He also wants to get our attention even more and win our hearts. His presence and His jealousy go hand in hand. As He is with us, He is involved in everything that concerns us and deeply committed to our hearts. As He is with us, He is the allconsuming fire longing for our pure and undistracted devotion. We won't truly understand His presence unless we understand His commitment. Both belong together. 24 For the LORD your God is a consuming fire, a jealous God. (Deut 4:24) 2 This is what the LORD Almighty says: I am very jealous for Zion; I am burning with jealousy for her. (Zec :2) 2. 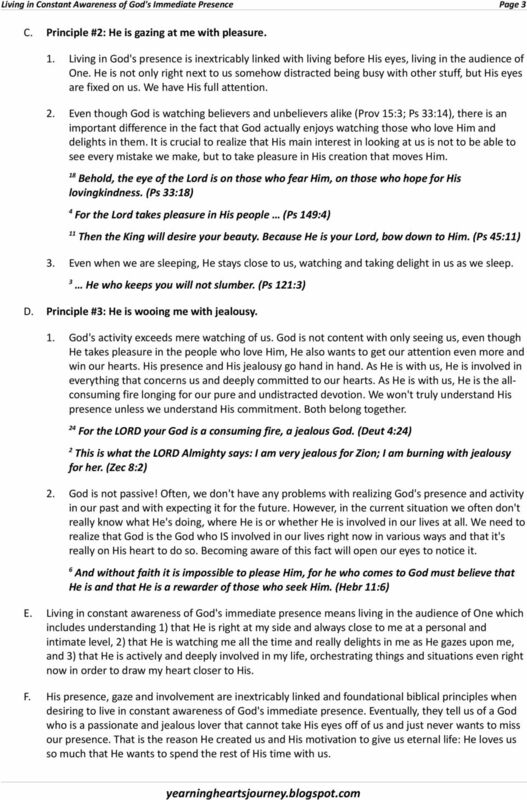 God is not passive! Often, we don't have any problems with realizing God's presence and activity in our past and with expecting it for the future. However, in the current situation we often don't really know what He's doing, where He is or whether He is involved in our lives at all. We need to realize that God is the God who IS involved in our lives right now in various ways and that it's really on His heart to do so. Becoming aware of this fact will open our eyes to notice it. 6 And without faith it is impossible to please Him, for he who comes to God must believe that He is and that He is a rewarder of those who seek Him. (Hebr 11:6) E. Living in constant awareness of God's immediate presence means living in the audience of One which includes understanding 1) that He is right at my side and always close to me at a personal and intimate level, 2) that He is watching me all the time and really delights in me as He gazes upon me, and 3) that He is actively and deeply involved in my life, orchestrating things and situations even right now in order to draw my heart closer to His. 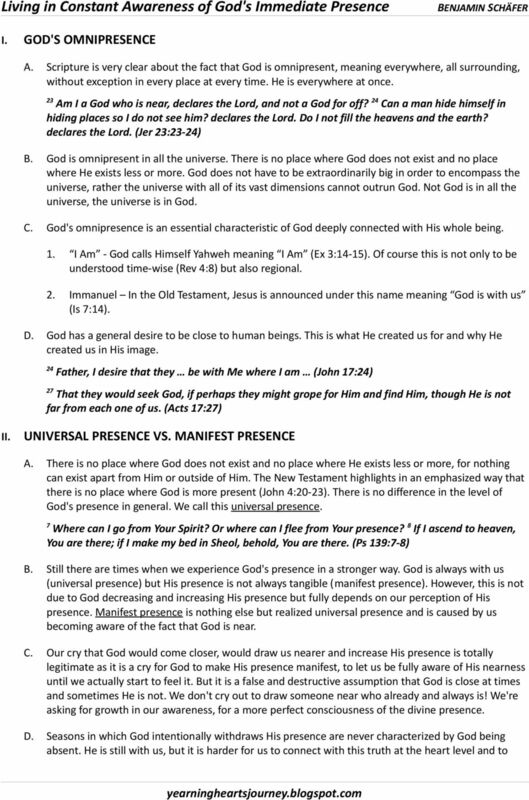 F. His presence, gaze and involvement are inextricably linked and foundational biblical principles when desiring to live in constant awareness of God's immediate presence. Eventually, they tell us of a God who is a passionate and jealous lover that cannot take His eyes off of us and just never wants to miss our presence. That is the reason He created us and His motivation to give us eternal life: He loves us so much that He wants to spend the rest of His time with us. 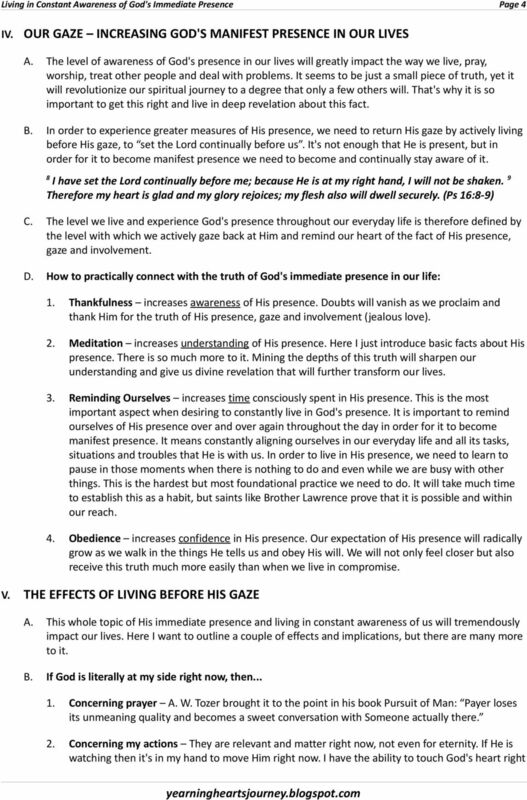 5 Living in Constant Awareness of God's Immediate Presence Page 5 now and it is possible for me to receive immediate feedback of what He feels. Whatever I do has immediate effect on His heart and emotions. We'll actually live more towards eternity when we realize that our actions matter now and not only some day. 3. Concerning sin I am not alone. Sin loses its attraction when I notice that someone is watching (Job 34:21-22). The more we live in awareness that God's eyes are on me, the less we will be tempted to sin. Just try it when temptation sets in. When realizing that the God full of love and compassion, full of power to deliver, abounding in gifts for you that satisfy you more than anything else, is with you, sin loses its attraction. Why would you draw from a lesser thing, if you realize you have the choice to draw from God right now. Likewise, not living in the awareness that He sees me or just the ignorance of the fact that He is with me can cause sin to increase. 12 Then He said to me, 'Son of man, do you see what the elders of the house of Israel are committing in the dark, each man in the room of his carved images? For they say, 'The Lord does not see us; the Lord has forsaken the land.'' (Ez :12) 11 He says to himself, 'God has forgotten; He has hidden His face; He will never see it.' (Ps 10:11) 4. Concerning fear Deeply connected to the truth of His presence and involvement is that fact that He is in control in our life and all its situations and challenges. If we realize that He really sees then it will change the way we view our struggles and release confidence even in the hardest seasons. I have set the Lord continually before me; because He is at my right hand, I will not be shaken. 9 Therefore my heart is glad and my glory rejoices; my flesh also will dwell securely. (Ps 16:-9) 5 Do not fear, for I am with you. (Is 43:5) 5. 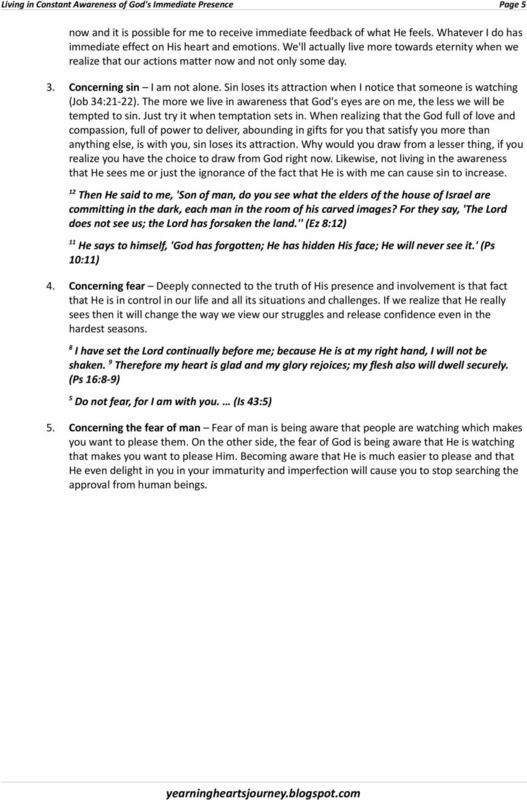 Concerning the fear of man Fear of man is being aware that people are watching which makes you want to please them. On the other side, the fear of God is being aware that He is watching that makes you want to please Him. Becoming aware that He is much easier to please and that He even delight in you in your immaturity and imperfection will cause you to stop searching the approval from human beings. creation ; old things have passed away; behold, all things have become new. Before you start, let s have a little fun. Grab a few crayons and a couple pieces of paper. Got it? Now, everyone draw a picture of Jesus. THEME: Living a Life in the Spirit To break the reign of sin and the patterns of our old life outside of Christ requires decisive action. How Can I Walk in the Fear of the Lord? This booklet contains a message of love and hope. An exciting adventure awaits all who discover these life-changing truths. entrust to you the true riches? And if you have not been faithful with what belongs to another, who will give you what is your own? Serving Two Masters This month I am looking at the stories Jesus told. And since I like a challenge, I am either looking at stories we don t usually hear about or a different view of a familiar story. DECISION-MAKING. Seeking the will of God in the midst of carrying out the work of God. Many leaders at many levels face this challenge. PRAY: Receive His forgiveness, mercy and grace move forward in freedom. Lost in the Middle The struggles of midlife begin long before midlife Don t wait until you re lost. NATIONAL BIBLE INSTITUTE NBI'S FREE QUIZ... "BIBLE: Basic Information Before Leaving Earth" Please answer all questions contained in the test. You will be contacted within a few days with your results. How to Analyze a Bible Passage The kind of study that can help you examine a small passage of Scripture is called analytical Bible study. Analytical Bible study gives you a detailed view of a Bible book. II. HOW WERE PEOPLE SAVED BEFORE JESUS CAME? Who Are the Evangelists of Ephesians 4:11? And what is their ministry in the New Testament Local Church today? The Fellowship Files (1) Why Church Membership? The Fellowship Files (1) Why Church Membership? Becoming a member of a local church is not just a good idea, it is God s idea. To be a committed Christian who is committed to Christian people pleases God.